FVC (Forced Vital Capacity): maximum volume of air that can be exhaled during a forced manoeuvre. FEV1 (Forced Expired Volume in one second): volume expired in the first second of maximal expiration after a maximal inspiration. FEV1/FVC: FEV1 expressed as a percentage of the FVC, gives a clinically useful index of airflow limitation. 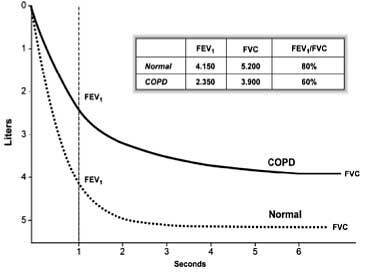 The ratio FEV1/FVC is between 70% and 80% in normal adults; a value less than 70% indicates airflow limitation and the possibility of COPD.